There are several things you can do to keep your horse warm in freezing temperatures, but many horses are well-equipped to handle most winter weather conditions themselves. Understanding your horse’s natural cold weather defenses will help you recognize conditions in which your horse needs your help when winter rears its head. Nature has given your horse an amazing ability to cope with freezing temperatures, and he starts preparing long before you take out your winter woolies. The longer hairs of his winter coat will appear as the hours of daylight decrease; his retinas receive less light, and this triggers a message to his brain to release the hormone melatonin to produce the winter hair. The hairs fluff up in cold weather to insulate his body, trapping his warm body heat and giving him protection from the external cold. If you live where it snows, you’ll see how well this works, as snow on his body will not melt because his body warmth is not escaping. You might notice a change in your horse when the season’s first cold snap hits. It takes at least 10 days to three weeks for your horse to fully adapt to cold weather. If it’s windy, he’ll probably stand with his hind end facing the wind, or seek shelter from trees or a run-in shed. Shivering also helps him generate body heat. He may stand still to save energy, and then run to generate more. Nature lowers both his body temperature and his respiratory rate to conserve even more heat and energy. If he has fat to spare, he can use some of that as an additional energy source. Your horse will expend more energy keeping warm when he’s cold, so his caloric intake needs to account for this extra energy. The best way to do this is with plentiful hay, in addition to his regular diet. He digests hay more slowly than grain, and the digestive process produces heat through natural, microbial fermentation. The slower digestion of the hay keeps him warmer for longer periods of time. If you can’t give him free-choice hay, give him at least an extra flake on cold days. If your horse is in good health and weight, is not new to the region’s climate and his winter coat is undisturbed, he’ll use nature’s defenses against freezing temperatures up to the lower critical temperature, or LCT. This is 15 below zero Celsius, or 5 degrees Fahrenheit. If the temperature falls below this, he needs your help. Give him access to a shelter if you can. You can also ensure his hay is plentiful, add a blanket, or both. Be aware that blanketing flattens his hair so it can’t raise and insulate him naturally. If you blanket, be diligent about monitoring him for excess heat on warmer days, and keep the blanket dry in wet weather. 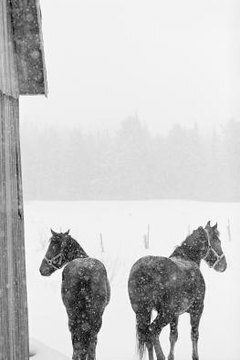 Old, young, ill or underweight horses will need blankets, stalls or shelters in freezing temperatures. If you body clip your horse, you must blanket him in freezing temperatures, even with a shelter or stall. When Should Alpacas Be Sheared? What Happens to a Male Deer's Antlers in the Winter?